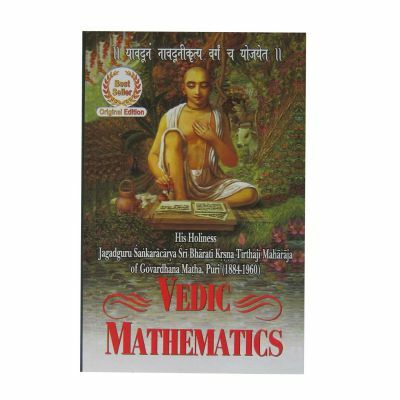 This epic and monumental work on Vedic Mathematics unfolds a new method of approach. It relates to the truth of numbers and magnitudes equally applicable to all sciences and arts. The book brings to light how great and true knowledge is born of intuition, quite different from modern Western method. The ancient Indian method and its secret techniques are examined and shown to be capable of solving various problems of mathematics. The universe we live in has a basic mathematical structure obeying the rules of mathematical measures and relations. All the subjects in mathematics--Multiplication, Division, Factorization, Equations, Calculus, Analytical Conics, etc.--are dealt with in forty chapters, vividly working out all problems, in the easiest ever method discovered so far. The work, forms a class by itself, which is the result of the intuitional visualization of fundamental mathematical truth and principles during the course of eight years of highly concentrated mental endeavour on the part of the author. The question naturally arises as to whether the Sutras which form the basic of this treastise exist anywhere in the Vedic literature as known to us. However, the subject is not to be approached from a factual standpoint but from the ideal standpoint, viz., as the Vedas are traditionally accepted in India as the repository of all knowledge. This approach entirely turns tables on all critics, for the authorship of Vedic mathematics then need not be laboriously searched in the texts as preserved from antiquity. At any rate, it is needless to dwell longer on this point of origin since the vast merit of these rules should be a matter of discovery for each intelligent reader.